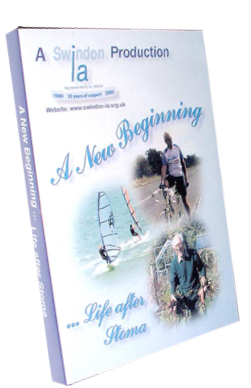 * In 1994, at the suggestion of our local health care professionals, we produced a patient information video to reassure new and future ostomists, and their families, that there was a full and active lifestyle to be enjoyed after their operations. * However, time moves on and it was recognised that certain aspects of living with a stoma were not addressed in the original video, so it was decided to re-shoot the project and offer it to stoma care nurses in DVD format. * Luckily, Swindon IA are very fortunate in having members within the group who possess the necessary skills to produce the project ‘in house’, thereby drastically minimising production costs. * It’s no secret that the DVD took very much longer to produce than first envisaged but we think the final result is something the group can be very proud of and well worth the wait. 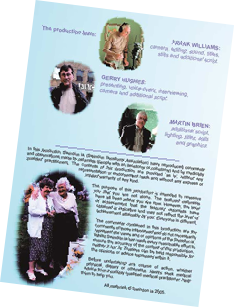 * With the obligatory legal formalities in place and the purchase of music licences completed, the project is now ready to be distributed to any stoma care nurse who requests a copy for their clinic. Initially, the project was presented to our local hospital at our 25th anniversary luncheon on July 31st 2005 and then made available to other interested parties. * Our project was screened at the September 2005 World Council of Enterostomal Therapists Congress Conference here in the UK and I am delighted to report that it was very well received by those present. * Copies of the project in DVD format are now available. To request a copy, please click on this link.